Not gifted | Helping the best to get better! ← HRV: new road or dead end street? I know a few respected colleagues that have mastered the ability to see things that I never could see. One of them could see if his high jumper is taking off at an angle of 36.5 or 37.0 degrees, another one can see if a sprinter’s right gluteus medius is firing or his rectus femoris is contracting at the right speed, this while the athlete is moving at 11 meters per second. Well…….. I can’t ……. I am unfortunately not blessed with this visual gifts. Nor can do I know which physiological system is recovered or not, or to what extend an athlete is tired or stressed or not. The athlete anyhow also could never tell me this to a useful extent, since he/she does not know it himself/herself in the first place. To me the expression “listen to your body” sounds strange, because the body does not speak loud and clearly, but just mumbles something diffuse like: “pain… chest…. left”. But that does not tell me if you have a sore pectoralis muscle or a slight myocardial infarction, not does the body tell us the different between a headache caused by lack of caffeine or a pain in the head caused by a brain tumor. But here is what helped me survive ……. technology and common sense (the sense that is less common than you think). One of the things that I use quite a lot is sEMG or surface electromyography. No needles in the muscle, but just simple disposable electrodes on the skin. Strange, that while the muscle is one of the main targets of our training, very few coaches are using EMG. EMG is mainly used by scientists in research or by physical therapists for rehabilitation in case of injuries. Now why would EMG be useful you might say. EMG, which to put it simply, measures the electric current running from the motor neuron over the muscle. The higher this current, the more motor unit activity is involved. the timing of the recruitment of the muscles in a kinetic chain e.g. which one is recruited first and is there overlap in activity of muscles. 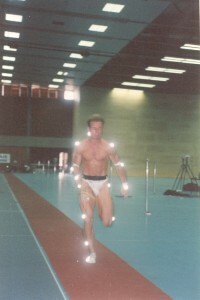 EMG 1 leg isometric knee extension, 10 seconds, A = vastus lat, B = vastus med. EMG in itself is a relatively simple procedure, the processing of the electrical signal is more complex, but offers many opportunities. EMG can be recorded in the lab as well as on the field or the track, because many systems have the possibility of recording the signal telemetrically. One of the my favourite uses of EMG is for the monitoring, but also the prediction of hamstring injuries. We developed this simple idea a long time ago. The protocol is simple: put EMG electrodes on quads and hamstring group (biceps femoris or semimembranosis and semitendinosis). With 4 channel recording one can do this for both legs at the same time. Now make a countermovement jump (stand straight up, go down, push off and land). If there is no hamstring problem, one will during the take-off or push-phase see a dominant quadriceps activity (Q) compared to hamstring activity (H). 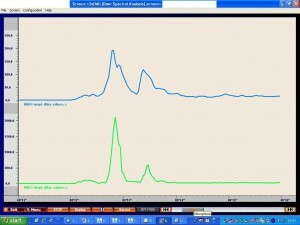 EMG worldclass soccer player, green = rectus fem, blue = biceps fem. If there is an existing or likely a future hamstring problem, one will find a dominant hamstring activity during take-off! Our explanation for this phenomenon is that it seems like hamstring is more active during take-off since it tends to inhibit or wants to control or slow down the fast knee extension, as fast knee extension may cause damage to the injury-prone hamstring. This simple protocol has helped me a lot in preventing hamstring injuries in sprinters, by detecting a problem before it turned into a strain or pull. To satisfy the readers that like to read some more about the use of EMG, here is a very short list. Cram, J.R; Kasman, G.S: Introduction to electromyography. Aspen Publications Gaithersburg, 1998. Lamontagne, M; Application of Electromyography in Sports Medicine, in: Puddu, G; Giombini, A; Selvanetti, A: Rehabilitation of Sports Injuries, Chapter 4, Springer, 2001, pg. 31-42. Masso, N; Rey, F; Romero, D; Gual, G; Costa, L; German, A: Surface electromyography applications in the sport; Apunts, 45(165),2010, pg.121-130. Felici, F: Neuromuscular responses to exercise investigated through surface EMG; J. Electromyogr Kinesiol 16, 2006, pg.578-585. Mileva, K.N; Morgan, J; Bowtell, J: Differentiation of power and endurance athletes based on their muscle fatigability assessed by new spectral electromyographic indices; J. Sports Sci. Vol.27, No.6, 2009, pg.611-623. Farina, D; Merletii, R; Enoka, R.M: The extraction of neural strategies from the surface EMG; J.Appl.Physiol. 96, 2004, pg.1486-1495. Escamilla, R.F; Babb, E; DeWitt, R; Jew, P; Kelleher, P; Burnham, T; Busch, J; D’Anna, K; Mowbray, R; Imamura, R.T: Electromyographic Analysis of Traditional and Nontraditional Abdominal Exercises: Implications for Rehabilitation and Training; Physical Therapy, 86, 2006, pg.656-671. Basics of Surface Electromyography. Applied to Physical rehabilitation and Biomechanics, Thought Technology, Montreal, Feb 2009, 48 pgs. How often do your test your sprinters? 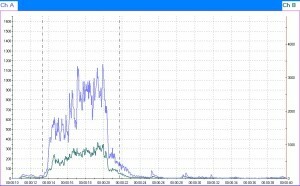 Once a week during an intense phase/block or more like once a month? “The rest of us” don’t have access to a lab on a regular basis hence my question. I know that Charlie Francis would use his hands as his tool to “feel out” muscle quality and attempt to avoid muscle pulls so I appreciate you using the EMG as one of your tools to keep your athletes healthy. Use your strength to achieve results. I can dig that!